Lifepoints Portfolios - Are they right for you? Looking for a Hands Off Investment Approach? Have you been looking for a managed or fee-based service, but with the flexibility of mutual funds? Lifepoints portfolios may be the answer. Lifepoints portfolios are a collection of mutual fund type investments. They use 20 of the world's top investment managers who manage 4 multi-style mutual funds. These funds are comprised of different asset allocations, depending on risk tolerance, to form a complete investment portfolio. The advantage? Your investments are managed by professional managers who are normally only accessible to institutional investors. Your personal portfolio would be managed by Frank Russell Canada Ltd. one of the world's leading investment services firms. They are best known for their money manager research, "multi-manager" investment funds and leading performance measurements such as the Russell 2000� Index. They have been providing investment management and advisory services to clients in 35 countries for more than 60 years. We have often had clients ask for a managed portfolio that they don't need to monitor or worry about. When this product was brought to our attention, we felt that it may fill that need for �hands-off, low maintenance' investing that many of our clients have asked about. For many investors, managed products simply haven't been practical due to the costs involved – usually quarterly fees as well as high minimum account sizes. The Lifepoints Portfolios have now opened the door for these investors looking for a viable alternative. One of the key features that the Lifepoints Portfolios offer is automatic rebalancing within the initial investment. This ensures that your investment balance of equities and fixed income remains intact according to what your objectives and risk tolerance levels are, no matter where the markets and interest rates may be. You make an initial lump sum investment (minimum $5,000) into one of the portfolios. You can purchase more than one portfolio if you like – but since they are made to be an all-in-one investment portfolio, it may defeat the purpose. 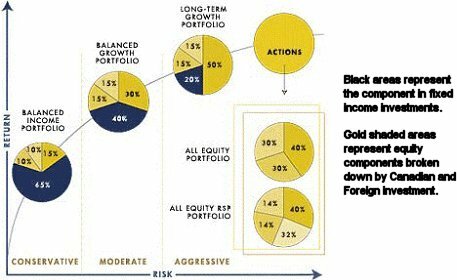 If you are looking for a conservative portfolio, you could invest in the Balanced Income Portfolio which is ideal for investors who are closer to retirement or are conservative by nature as they hold approximately 65% in fixed income (bonds/coupons etc...). For the rebalancing, if the Canadian Equity portion of the portfolio did exceptionally well, the managers would take the profits and bring the portion of the portfolio in equities back down to the appropriate levels- in this case, 15%. This is important because you would be reducing your equity component when it is doing well and in positive territory. In the other scenario, when equities are down, you would be adding to these positions while the market is lower and potentially more attractively priced. This takes away from the problem of emotional investing (see MFR issue 171 – May 2001), which can cause investors to rebalance inappropriately due to market concerns (Sept 11th) or optimism (the Tech bubble). Most managed product accounts charge an annual or quarterly fee on top of stock trading commissions. Lifepoints operates similar to a mutual fund. It charges an MER (Management Expense Ratio) that comes off of the returns and involves the cost to transact and manage the funds. The management fee ranges from 2.25% for the most conservative portfolio to 2.6% for the most aggressive (as they would be the most likely to be actively traded). This is comparable to most equity and balanced mutual funds. As a direct benefit to the investor, the investment is offered on a no load basis which means that there are no fees to buy or sell the fund. Who are these investments ideal for? If you are looking for a one-stop, fully managed investment portfolio that will transition with you throughout the various stages in your life. If you are interested in achieving multiple levels of diversification. Ideal for account sizes ranging from $5,000 to $100,000+. There is minimal return history to look at. Not that returns are any guarantee of future performance, but it is sometimes difficult to gain perspective when you have no figures to compare. For you to change over your accounts to this new portfolio allocation, there may be fees involved in the sale of some of your holdings – in which case we may not recommend the change over for existing positions. On the other hand, for new investments, you could slowly make it a part of your portfolio until any mutual fund deferred sales charges (if applicable) expire. More expensive bond management than holding bonds directly. Also, as with all investments, this product may not be right for your objectives. Each investor has separate and unique needs. You may already have a well-diversified balanced portfolio that doesn't require any alteration. Other managed account programs available through ScotiaMcLeod such as Sovereign, Summit, Pinnacle, AGF Harmony, CI Portfolios and AIM Core Fund Bundles. If you are considering this as a strategy for your retirement portfolio, please call (1-800-387-9273) or e-mail us and we can help you go over your options. For more information, visit our Managed Accounts Page. There is a new, innovative Labour Sponsored Investment Fund (LSIF) from Talvest who run the Canadian Medical Discoveries Fund. The new fund is �Starting Startups'. It invests in Venture Capital IT companies that are in their earliest stages of development. They provide unique access to seed-level companies. Keeping in mind that with potentially higher returns usually comes higher risk. Talvest's Starting Startups Fund also offers a 35% tax credit (to Ontario Taxpayers), worth considering for a small portion of your portfolio.